The Slide has a very interesting genesis. 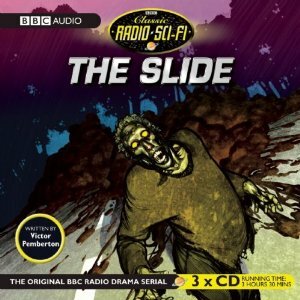 Inspired by his fears of England being hit by a major natural disaster, famed British scriptwriter Victor Pemberton originally pitched it as a Doctor Who storyline in 1964. After it was rejected, he retooled it as standalone radio project. A few years later, he reworked the concept into the Doctor Who serial Fury from the Deep. On top of that, some elements from that revision worked their way into Doctor Who and the Pescatons, the first audio drama of the franchise! Adding to the Doctor Who connection are the theme music and sound effects created by the Radiophonic Workshop and Roger Delgado (better known as “The Master”) plays the heroic Dr. Josef Gomez (whose lines were ironically given to Dr. Who in the Fury from the Deep reworking). As far as I’m concerned, Delgado’s performance is the highlight of The Slide. The Slide runs for seven episodes, and could have benefited from having an episode or two trimmed out during the planning stage of its production. The constant repetition of scenes featuring people discussing organisms in the mud or possessed people acting weird gets very old very fast. I’m guessing these were included for the benefit of people who tuned in midway through the story, but it still drags the story to the point where it seems much, much longer than its 3 and a half hour running time. That’s not to say there aren’t good things about the script. Although you might think a story which constantly jumps from location to location would be confusing, The Slide handles it quite well. I especially liked the idea of the possessed people rounding up and trapping normally resistant people to break their wills and how the ending was not all flower and sunshine. I think this drama will appeal the most to those looking for a Quatermass-esque adventure and diehard Doctor Who fans. Apparently lost for some time, this release of The Slide was created using recording from Mr. Pemberton’s personal collection. I didn’t notice any issues with the audio and I doubt anyone would notice this wasn’t taken from the original masters unless they were told in advance. As is the case for AudioGo’s radio drama releases, The Slide comes with excellent liner notes which detail the history of The Slide, trivia and reproductions of vintage ads. In fact, they reveal that Amicus was considering a film adaptation at one point! Oh, and if you’re wondering about the title, the liner notes reveal it’s a reference to both a slide into chaos and the mud its sliding out cracks in the earth.